Subtle cues with elongated fade counts submerse the audience into the shadows and into the color that make up the delicate touch of light onstage. ‘Made in China’ by Wen Wei Dance, was a sensational yet contemporary dance show about identity and commoditization in respect to the Chinese culture. It was performed at the Firehall Arts Centre in February running from the 19th to the 21st, 2015. It is created by visionary Wen Wei Wang with collaborators Gao Yanjinzi, Qiu Xia He, and Sammy Chien. Lighting Designer (LD) Jonathan Kim is also a noteworthy collaborator as he added a certain deep elegance to the presentation of the work. It is the visual atmosphere between the projectionist, Sammy Chien and LD Jonathan Kim that I wish to address , as contemporary performance is currently going through an emergence of projection based technology, not just as a means to create visuals but also as a performance connotation. Photo courtesy of Chris Randle. A rare but touching personal introduction to the performers was the first thing the audience experienced. Something that is a little uncommon for a great deal of Vancouver’s performance arts but integral to the theme of this show. Each of the four performers gave a brief but colorful story of their personal history and connection to their art and upbringing, specifically they’re being ‘made’ in China. This reflects on the central theme of the commoditization and industry of China. The layout of technology also lends itself to this theme. Onstage were two stations, one for traditional Chinese musical instruments and another for Hi-tech audio devices, computer controlling projections and a theatrical lekolite. All of this is in plain view as to not disguise the show in any unnecessary theatricality or illusion, as if they were revealing ‘how it is made’. This leads us into the first theatrical lighting cue as Wen Wei shifts his origin story from words into movement and adorns a white material, as if it were a cocoon. The lights gracefully made the cocooned Wen Wei glow. What followed was an exploration of contemporary dance with what Wen Wei calls ‘a twist of Asian flavour’, enriched by traditional music, sound design and a plethora of projections. The lighting was underplayed in a minimalist fashion as there were few cues and relatively coaxing transitions, but it provided depth to an other wise projection dependant show. In an essay by Ian Horswill and Magy Seif El-Masr, the authors are concerned with the effects of expressive lighting and the radical changes that sometimes occur and break the audiences belief. They also express a certain need for depth, something that a single projection source, like the one used in this show, can hardly achieve. The visual of having such stark silhouettes on the back wall is appealing, it also drew my gaze to the more obvious and larger moving forms instead of the graceful movements of the dancer. With multiple projection devices, Chien would have created more dynamism without resorting to such contrasting effects one after the other. 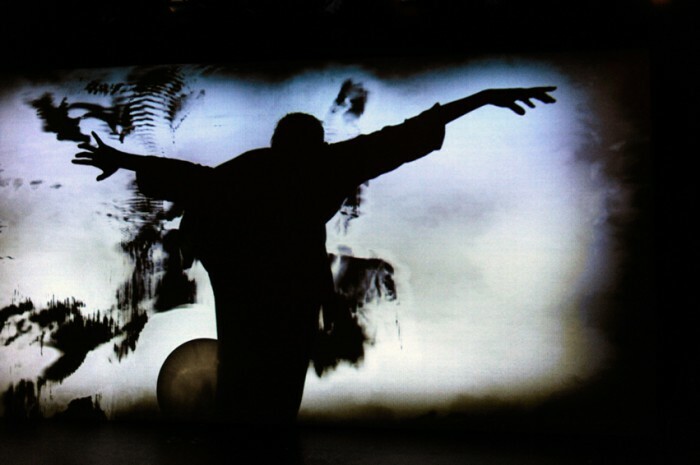 This tactic is used successfully by projectionist Parjad Sharifi in last summer’s production by Leaky Heaven ‘To Wear A Heart So White’, and in Chien’s design in Ascension in 2012. One of the trends of modern contemporary performance is to include the newest technologies available. This is done to varying degrees of usefulness within the piece, and this production was in no way an exception. Chien, the projectionist for ‘Made in China’ provided a plethora of content for the show and it resulted in incredibly breathtaking visuals, which left you with a numbing sensation to the core. His use of motion tracking provided a surrealist depth and suspended temporality to the dancer’s movements, however the the overbearing use of this tech resulted in a visual and auditory overstimulation with an overbearing amount of pixilated harsh colors in constant flux. The bright colorful boxes flashing at incredible rates during the climax proved to be a little shaking for several audience members as it combined a juxtaposed audio track of traditional and contemporary sounds at uncomfortably high levels. This might have been an intended effect but began to impede certain connections to the performance. The lighting was the most profound and personal aspect that I took from the experience. The design Jonathan Kim implemented was not detraction from the intended visual effects onstage. Instead it served to guide the piece in warmth and tone, softly adding glow to the bodies embedded in the harshness of the projector. Wen Wei’s philosophy on of revealing all technical implications to decrease the illusions often associated with live performance was enacted with seamless ability. 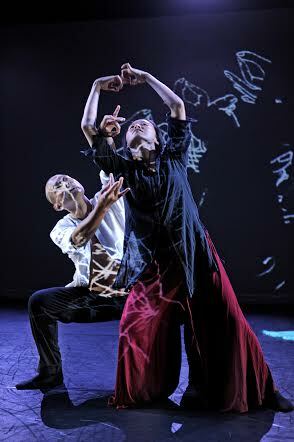 The combination of these two visual technologies created a rich environment for the performers. The technology, props and musical instruments used within this piece were seen and their objecthood included within the scope of the audience’s perception. Such a rich diversity of talents contributed positively to the cultural phenomenon. The exploration of Chinese identity was rooted in the duality of the technologies and audio presented. However I would argue for a slightly less obvious or more elegant approach to projection technology as it related to the show. In all of its connotations, ‘Made in China’ was breathtaking.